The second issue of Safari – Science and Knowledge magazine from India – for the year 2014 hit the stand and here are our personal and informative reviews for the same. 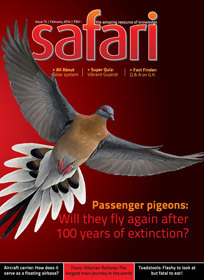 The cover page shows a graphic of passenger pigeon give Safari Magazine – February 2014 issue – Cover Page[/caption]ing us hint about an article about them. And there is a 6 page article found inside about – Passenger Pigeons – focused on the question: Will they fly again after 100 years of extinction? Blessed by the nature with the body parts allowing them to fly for a long, passenger pigeons found travel in a flock (which contains thousands or even millions of them), covering a very large area of the sky. When they took rest on the tree, these small birds, due to their number, are capable to bend the branches of the tree. In a sad note for them, they are easy to target, and the shooter even need not to worry about finding target when a flock of passenger pigeons is flying. There are more interesting information available inside the article which is worth a read for sure. One thing this magazine lack is – the editorial. Since our days in the school we know that the longest train journey in the world is through – the Trans-Siberian Railway. We know the basic facts about the same which were available to us via our textbook. There are several interesting facts might not known to us which are covered in a 5 page article about the same. The article contains photos, illustrations and maps of the related stuff. An interesting read. Life is probably the most mysterious thing we have ever known about! We love to know what will happen to us after the death, right? A lot of people are curious to know that, is it possible to bring back the people who are dead? Well, let us forget about something superficial or fantasy oriented, is it possible to do medically? An article titled Medical miracle of bringing people back from the dead! caught our attention from its title and it is found interesting 5 page read. Mushrooms gives us a feeling of landing spacecraft (or flying saucer) are good food to eat. This veg food contains good amount of nutrients needed for the body. But, there are some toadstools which are attractive when you look at them but prove dangerous when you try to eat them!! An article about them will interest mainly to food or botany lovers. Mikhail Kalashnikov – the inventor of one of the deadliest weapon – the series of which is named after him (Automatic Kalashnikov – AK 47) passed away in the last December. The – Fast Facts – segment this time is focused on him and his invention AK 47. The summarized article keeps most of the important stuff about AK 47 which you like to know. We know that AirCraft carries are very important part of the Navy of any country with remarkable sea-coast. Though, we often wonder, how it functions or how does it serve as a floating airbase and play its role as the force multiplier. There is an article about Aircraft careers which is mainly focused on – INS Vikramaditya – the latest addition in Indian Navy. This 7 page wide, very detailed article is a must read. Q & A : Fact Finder : segment answers the following questions. How is a pearl formed inside the seabed oyster? Which has been the highest-price paerl? How do plant manage to turn towards the light? Is it true or just an urban myth that trees help combat air pollution by soaking up noxious gases and sweeping up particulate contaminants? What makes Jupiter’s moon ‘lo’ our Solar System’s most volcanically active body, with its volcanic ejects shooting up several kilometers high? If all the people of the world go vegetarian, how would it affect the global food supply? Would it lead to wide-spread semi-starvation or over flowing food baskets? While an overweight person obviously look obese, is there a rule-of-thumb that can be used to figure out whether one has accumulated enough body fat to be categorized as obese? How far can a passenger see as she or he gazes out the aircraft window during Mumbai-Ahmedabad flight? What does “ballistic” mean when associated with ballistic missile? The segment is interesting. Comparatively less questions are answered, but the answers are detailed enough. The – Super Quiz – of this month is focused on Vibrant Gujarat. A fair study of 10 important aspects of the state of India. The – All About – article this time brings detailed information about – Origin of the Solar system. It is an interesting read. Overall a magazine issue which is worth for the money and importantly the time you spend reading it. Our personal verdict – just go for it.